53rd Croatian Children's Film Festival | News | 53rd Croatia Children's Film Festival is closed! The most awards went to Čakovec and Hodači po žici and ZAG from Zagreb! 53rd Croatia Children's Film Festival is closed! The most awards went to Čakovec and Hodači po žici and ZAG from Zagreb! 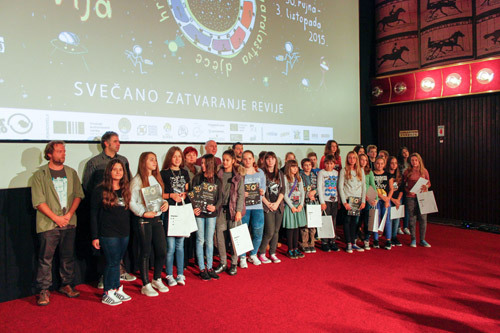 Award ceremony for the 53rd Croatia Children's Film Festival was held in Rijeka this Saturday. Festival was organized by the Croatian Film Association for the past half a century and this year's co organizers were Art-cinema Croatia from Rijeka. 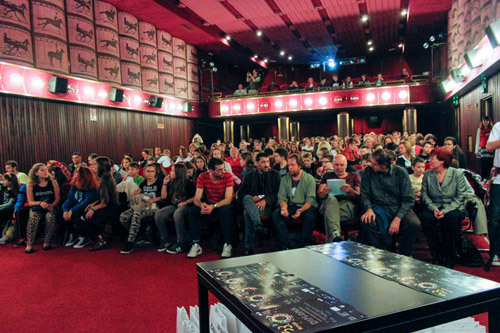 Awards for the best animated, documentary and fiction films, TV reports and films in the open category as well as the workshop films were awarded by the professional jury; Simon Bogojević Narath, Maja Flego, Boris Poljak, Aleš Suk and Slaven Zečević as well as the international children's jury. Udruga Hodači po žici from Zagreb and Škola animiranog filma Čakovec won three awards, some from the adult jury and some from the children’s jury. Best animated film was I don’t care, ŠAF Čakovec and Parental bans from FKVK Zaprešić. Best documentary was My house, my freedom by Videodružina BezVizije from Slavonski Brod and Dream job by Filmska družina ZAG from Zagreb. Fiction film number one was Loser by Audiovizualni centar Dubrovnik by both juries. Best TV report by the adult jury was More than a game by Mala Subotica elementary school and by the children’s jury the best was Life goes on by Studio kreativnih ideja Gunja. Best film in the open category was We’re stronger together by Katarina Zrinska Elementary school from Mečenčani and TV sale by Većeslav Holjevac Elementary School from Zagreb. Award for the workshop film went to Conscious by Blank_filmski incubator from Zagreb and Shoes have secrets too by Blago Zadro Elementar y school as well as the Chocolate with Chocolate by Blank_filmski incubator. „When they called my name to pick up the award for the third time I didn't want to go. I was embarrassed because they only called me and not the other kids. My friend dragged me to the award“ confessed humble author of the film Diploma for courage. Children's jury picked their two most active members for the surprise award; participation at the film and video workshops in Kraljevica next summer. This prize went to Damjan Popovski from Macedonia and Klara Krečar from Rijeka. Festival was closed by co organizers of the next year's Festival that will be held in October in Makarska. Students will be hosted by Zimmer frei cinema and Dokuma.